The goal of this post is to show the math of backpropagating a derivative for a fully-connected (FC) neural network layer consisting of matrix multiplication and bias addition. I have briefly mentioned this in an earlier post dedicated to Softmax, but here I want to give some more attention to FC layers specifically. Which is the matrix multiplication of and . are [1,T] (one row, T columns). are then [1,NT]. This makes sense if you think about it, because as a function of W, the loss has NT inputs and a single scalar output. (j being the column of W); when the element is in any other row, the derivative is 0.
being the derivative for the j-th column), and so on. While the derivation shown above is complete and mathematically correct, it can also be computationally intensive; in realistic scenarios, the full Jacobian matrix can be really large. For example, let's say our input is a (modestly sized) 128x128 image, so N=16,384. Let's also say that T=100. The weight matrix then has NT=1,638,400 elements; respectably big, but nothing out of the ordinary. Now consider the size of the full Jacobian matrix: it's T by NT, or over 160 million elements. At 4 bytes per element that's more than half a GiB! Moreover, to compute every backpropagation we'd be forced to multiply this full Jacobian matrix by a 100-dimensional vector, performing 160 million multiply-and-add operations for the dot products. That's a lot of compute. found above - it's fairly straightforward to compute using a single multiplication per element. We've just seen how to compute weight gradients for a fully-connected layer. Computing the gradients for the bias vector is very similar, and a bit simpler. is still [1,T], because the number of elements in y remains T.
Where the shape of X is [N,B]; B is the batch size, typically a not-too-large power of 2, like 32. W and b still have the same shapes, so the shape of Y is [T,B]. 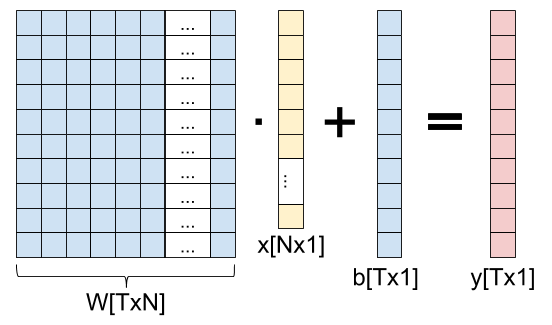 Each column in X is a new input vector (for a total of B vectors in a batch); a corresponding column in Y is the output.
. While the end results are fairly simple and pretty much what you'd expect, I still want to go through the full Jacobian computation to show how to find the gradiends in a rigorous way. : [1,TB] because Y has T outputs for each input vector in the batch. has TB outputs and TN inputs overall. : [1,TN] same as in the batch-1 case, because the same weight matrix is used for all inputs in the batch. to talk about the i-th element in the b-th input vector x (out of a total of B such input vectors). Which makes total sense, since it's simply taking the loss gradient computed from each batch separately and adds them up. This aligns with our intuition of how gradient for a whole batch is computed - compute the gradient for each batch element separately and add up all the gradients . This is a good place to recall the computation cost again. Previously we've seen that for a single-input case, the Jacobian can be extremely large ([T,NT] having about 160 million elements). In the batch case, the Jacobian would be even larger since its shape is [TB,NT]; with a reasonable batch of 32, it's something like 5-billion elements strong. It's good that we don't actually have to hold the full Jacobian in memory and have a shortcut way of computing the gradient. Which just means adding up the gradient effects from every batch element independently. This post started by explaining that the parameters of a fully-connected layer we're usually looking to optimize are the weight matrix and bias. In most cases this is true; however, in some other cases we're actually interested in propagating a gradient through x - often when there are more layers before the fully-connected layer in question. with the i-th column of W.
Again, recall that our vectors are column vectors. Therefore, to multiply dy from the left by W we have to transpose it to a row vector first. The result of this matrix multiplication is a [1, N] row-vector, so we transpose it again to get a column. These two methods produce exactly the same dx; it's important to be familiar with these tricks, because otherwise it may be confusing to see a transposed W when we expect the actual W from gradient computations. As explained in the softmax post, we linearize the 2D matrix W into a single vector with NT elements using some approach like row-major, where the N elements of the first row go first, then the N elements of the second row, and so on until we have NT elements for all the rows. This is a fully general approach as we can linearize any-dimensional arrays. To work with Jacobians, we're interested in K inputs, no matter where they came from - they could be a linearization of a 4D array. As long as we remember which element out of the K corresponds to which original element, we'll be fine. In some cases you may hear about averaging the gradients across the batch. Averaging just means dividing the sum by B; it's a constant factor that can be consolidated into the learning rate.